Resistance to Change in M&A | How Much is Normal? 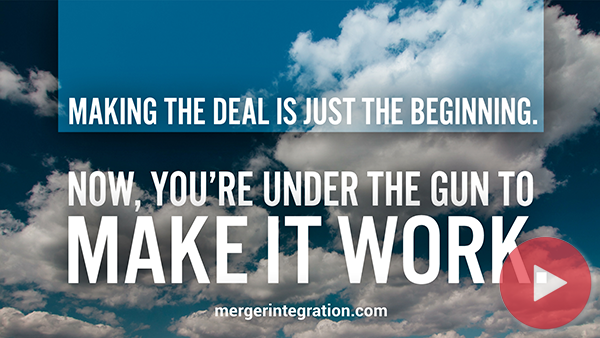 What sort of push-back is predictable in an M&A integration? How much resistance is “reasonable”? If you have a reliable frame of reference, you can put things into perspective. Knowing what’s “normal,” you’ll have a better feel for how you should react to the particular situation facing you. So let’s look at the typical scenario. We’re dealing in generalities here, but the breakout usually goes about like this. Some 20 percent of the people in the acquired company are “merger-friendly.” They’re clear advocates who willingly embrace the combination. You can depend on them to help drive the program. Another 50 percent of the folks sit on the fence. They assume a so-called neutral position, trying to figure out which way to lean. They’re not necessarily hostile to the merger, but they’re not helping like they should. The remaining 30 percent are the resisters. They’re antagonistic toward combination and often deliberately try to make it fai. Guess which group makes the most noise? And who do you think soaks up the most management time and energy during the integration? The resisters, of course. Resistance is seductive stuff. It’s hard to ignore. But this is the group that gives you the least return on the efforts you invest. And giving resisters your attention often just reinforces their problem behavior. It’s sort of like giving media attention to a small band of protesters who are demonstrating. They love it when they make the evening news, and become even more determined in defending their cause. It makes more sense to spend your time trying to woo the fence-sitters. You have far better odds of winning them over. You also should devote generous attention to the 20 percent who are driving the change. They deserve it the most, but ordinarily they’re taken for granted. Romancing the resisters, to a large extent, is a distraction. Sure, you can put the change effort on hold and focus on turning these people around. But how long will that take? Can you actually pull it off? And is it even essential? Really what you’re after are hard results from the acquisition, rather than getting people to feel happy about what’s going on. Never presume that you must have buy-in from everyone before you move forward. For a good percentage of people, buy-in will only come later—if at all—after the results are in which prove that the deal was both appropriate and successful. THAT ARE ACTUALLY CARRYING THE LOAD.